After all my time away, I'm thrilled to rejoin the Make The Day Special DT. I've really missed playing with my lovely stamps - so I was thrilled to have some time this weekend to get stuck in. My fingers are now satisfyingly inky! 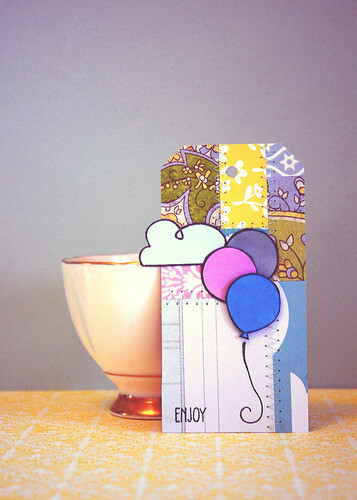 First I made a couple of little gift tag backgrounds using some teeny, tiny scraps. It's really simple, just stick them down, then sew them up! I thought the colours would be perfect for spring - even though they're actually scraps from my October Counterfeit Kit. It's the kit that just won't end! The first tag uses a partial sentiment and balloons from Admit One and a little cloud from Bon Voyage - both sets from Lawn Fawn's Summer 2011 Release. Still one of my favourite stamp collections! 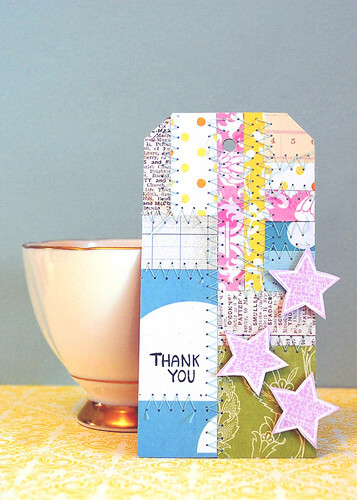 The second tag uses a simple sentiment from Cruising Through Life, another set from Lawn Fawn's Summer 2011 Release, and some pretty stars from Learning Year By Year, one of Unity's Store Kits. Such super, simple stashbusting projects that I hope will add a little 'something, something' to my gifts. Super cute and you make it look so easy! Sure my stitched tags wouldnt look half as lovel as these. Very pretty. They are really pretty and so nicely photographed - a tag on its own would make a gift without anything else! Neat (in both the British and the American sense)! Welcome back and thanks for popping over to my blog. Love those tags - I have some very over due RAK prizes to send out - might just include something like this. Come over to soul scrappers, I have a recipe challenge live (postcard and hidden photo) and will be extending the deadline until Sunday.